Jaeger-LeCoultre Perpetual Calendar Tourbillon 186.2.35.S. 18ct Pink Gold Jaeger-LeCoultre Perpetual Calendar Tourbillon 186.2.35.S. Case diameter 42mm. 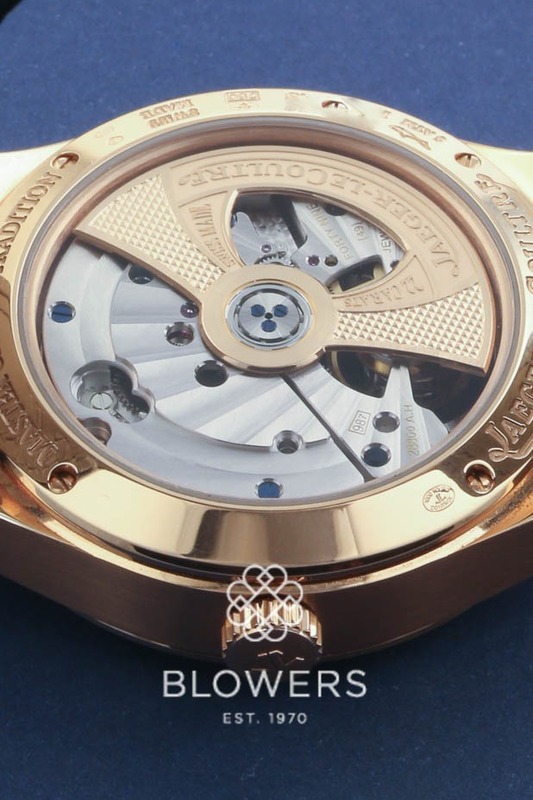 Automatic calibre 987 movement, 49 jewels. Silver dial with gold hour markers and Dauphine hands. Year and month indicators at 12 o’clock position, day and moon phase at 3, date at position 9 and tourbillon at 6. Sapphire crystal case back. Brown croc strap with double folding 18ct pink gold buckle. Box and papers dated July 2011. SKU: 3015284. Categories: Jaeger LeCoultre, Master.